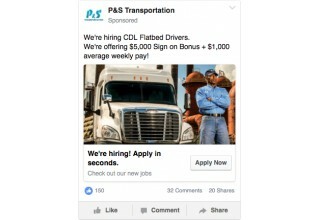 Work4, the global leader in Facebook recruitment, has announced successful collaboration with P&S Transportation. In 2017, Work4's technology has allowed P&S Transportation to reach new drivers, increase the volume of qualified candidates by more than 100 drivers per month, and to decrease the cost-per-applicant to $18 USD. SAN FRANCISCO, February 23, 2018	(Newswire.com) - "Work4 brings candidates we would never have been in front of with our previous efforts,” attests Sherri Sherman, Director of Recruiting at P&S Transportation. P&S Transportation is a logistics leader specialized in the flatbed hauling. They operate in more than 14 locations across the U.S. with a fleet of over 1,000 trucks. As every other transportation organization, driver recruitment is at the heart of their success. P&S’s main pain point was not finding enough qualified candidates in the areas of their operations. Traditional application sources didn’t give enough satisfaction in terms of geolocation and applicant conversion. As result of not getting enough qualified drivers, the company couldn't operate at its full potential. P&S also had a challenge increasing the visibility of their core organizational values. P&S Transportation has a unique approach in the transportation industry in taking care of their drivers. They needed a way to get their opportunities in front of the right drivers and leverage their organizational culture to improve recruiting. 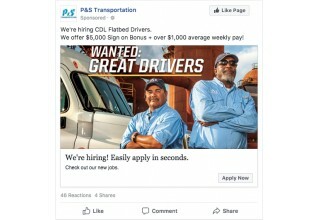 P&S Transportation knew that Facebook was the biggest untapped resource to hire drivers. In fact, Facebook represents the biggest audience of drivers with more than 75% of them using the social network daily. The company turned to Work4 to implement its Facebook hiring strategy in 2017. In detail, the initiative was to develop their career applications on multiple Facebook pages and most importantly, to build the advertising strategy and applicant funnel for their open positions. Work4 Technologies allows P&S Transportation to reach drivers that they can not find on any other recruiting platform. 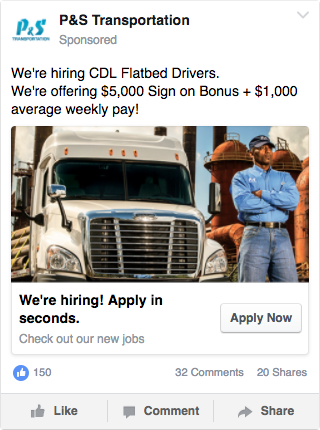 The W4 Pipeline technology is leveraging Facebook Ad audiences to optimize the cost per applicant and to pre-qualify drivers thanks to custom questions and applicant delivery. P&S Transportation is also integrating advanced features like auto emails and text messaging to nurture candidates through the process. 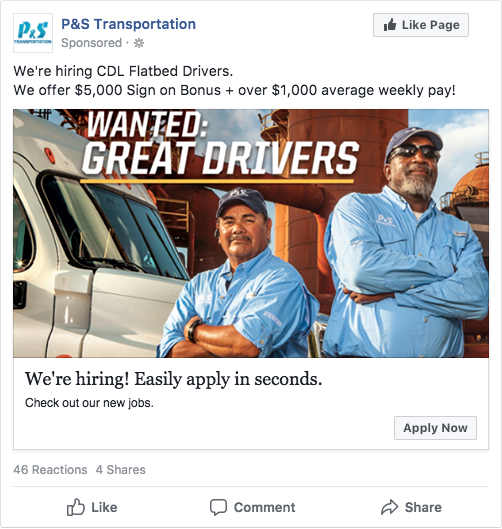 Today, P&S Transportation is provided guarantees from Work4 to have the optimal candidate funnel for drivers and to improve their employer branding visibility with monthly fixed costs in place. Work4 increased the P&S Transportation recruitment strategy significantly since day one. In the end, the volume of qualified candidates has increased by more than 100 drivers per month so recruiters can spend more time talking with future hires rather than sorting through unqualified applicants. In terms of Ad performance, their conversion rate from apply start to apply finish is above 44% and their cost per applicant is under $18. The time to fill a position has also greatly improved thanks to W4’s Pipeline integration with Tenstreet. By innovating in new sourcing channels and thanks to their great driver culture, P&S Transportation can be proud to have a turnover rate that is 60% less than the industry average. As a global leader in Facebook recruitment, Work4 enables more than 700 companies to attract and recruit their future talent on the #1 social media platform in the United States. 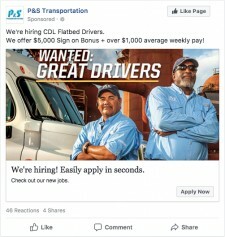 Thanks to Work4’s solutions, customers can use Facebook as a powerful recruiting platform by leveraging our unique technologies to promote their open requisitions in the biggest American candidate pool. Tailor-made targeting is available to reach the right candidates for the right positions and eventually recruit the most qualified candidates. Since 2010, Work4 has quickly become a global leader in the French and US recruitment advertising market thanks to its pioneering products, partnerships with Facebook and Twitter, and internationally-renowned investor support from Matrix Partners and Serena Capital. Work4 is the leader in Facebook recruiting solutions. We help thousands of companies — including Intel, Amazon, Paypal — connect with talent on social networks. Our technology transforms Facebook into a source of top quality talent. Adecco, the largest French staffing organization, launched its Facebook chatbot called Aloha. The challenge was to target new candidates that didn't already exist in their database through Facebook. After 12 weeks of the campaign, Work4's solutions launched 18,500 chatbot conversations representing more than 60% of Aloha's new visitors and accounting for the best "cost per conversation" - $0.95. Southwest Airlines wanted to improve referrals with a platform that allows employees to automatically share jobs in engaging formats on their social networks. They found in Work4 the perfect solution: over 12 months, employees have shared jobs 42,392 times using Work4's platform. Those job shares were then clicked on 87,245 times by candidates who saw them in their newsfeed.